Lawyer Yoo Young-ha, a confidant of ousted former President Park Geun-hye, on Thursday conveyed Park’s disappointment at former Prime Minister Hwang Kyo-ahn’s bid for leadership of the main opposition Liberty Korea Party. “Former Prime Minister Hwang Kyo-ahn told prison authorities he wanted to meet the (former) president, but she declined,” said Yoon in a rare TV interview. “I believe the public will be able to judge whether former Prime Minister Hwang is a pro-Park figure,” added Yoo, the only person currently in touch with the imprisoned Park. Hwang was justice minister and prime minister during the Park administration. Since Hwang declared his candidacy for the party’s leadership last month, he has been distancing himself from Park and his role in the former administration. 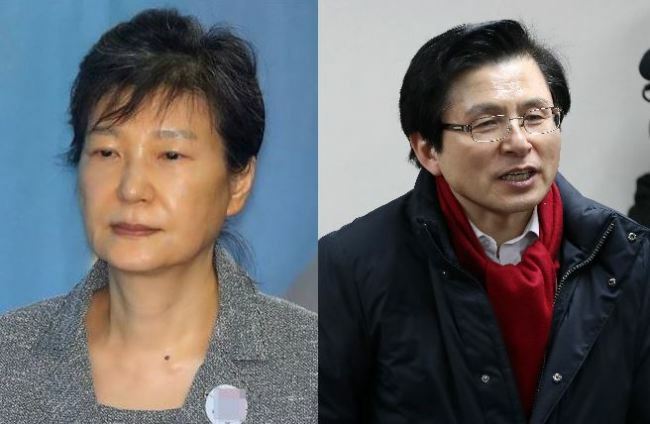 The recent interview is widely viewed as an indication of Park’s disappointment toward Hwang, ahead of the Liberty Korea Party’s national convention slated for later this month. Born in Daegu, North Gyeongsang Province, Park remains an influential figure in the party’s stronghold Gyeongsang provinces. Among some 330,000 members of the Liberty Korea Party, roughly 100,000 people live in Daegu and other areas in North Gyeongsang Province, making the region vital in clinching the party leadership. “Due to Park’s weak back, several requests were made for a desk and chair starting March 31 2017, the day Park’s arrest warrant was issued. We asked for honorable treatment of the ex-president, but the requests were ignored,” Yoo said. Yoo added that he was unsure if then-acting President Hwang was aware of such requests. Park was eventually given a desk, a chair and a bed when President Moon Jae-in took office. Regarding former party leader Hong Joon-pyo’s remarks on pardoning Park, Yoo questioned if Hong had offered any practical help to date.